South Korea's president publicly shook hands with Kim Yo Jong tonight. 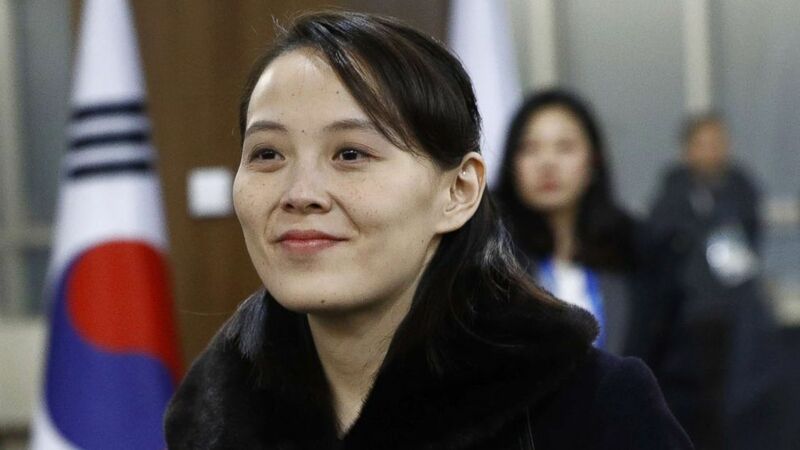 Kim Yo Jong, the younger sister of North Korea's supreme leader, is heading up North Korea's government delegation of 22 high officials to the Olympic Games in Pyeongchang. They arrived in South Korea earlier today ahead of the opening ceremony with all the fanfare of a celebrity entourage. The arrival was broadcast live on South Korean TV. (Patrick Semansky/Getty Images) Kim Yo Jong, sister of North Korean leader Kim Jong Un, arrives at the opening ceremony of the PyeongChang 2018 Winter Olympic Games at PyeongChang Olympic Stadium, Feb. 9, 2018 in Pyeongchang-gun, South Korea. 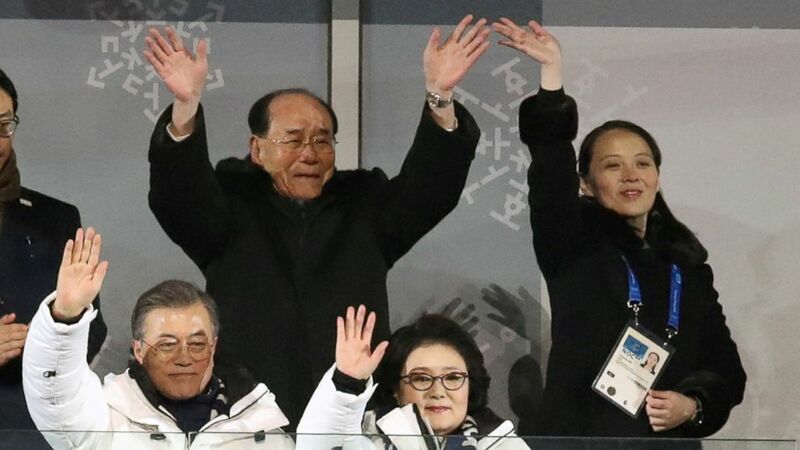 (Yonhap/REUTERS ) South Korean President Moon Jae-in and wife Kim Jung-sook, North Korea's Kim Yong Nam, and North Korean leader Kim Jong Un's sister Kim Yo Jong wave at the Winter Olympics opening ceremony in Pyeongchang, South Korea Feb. 9, 2018. Kim Yo Jong walked out of the plane, officially becoming the first person from the Kim Dynasty to step on South Korean lands since the end of the Korean War in 1953. Broadcasters displayed the three-hour journey of the North’s high-level delegation from their arrival in the airport to the Jinbu train station near Pyeongchang. After a conversation with senior officials from the Unification Ministry, the delegation hopped on a train to go to Pyeongchang where the "peaceful Olympics" officially kicked off tonight. South Korean broadcaster YTN showed pictures of Kim Yo Jong smiling and talking to the South’s unification minister. 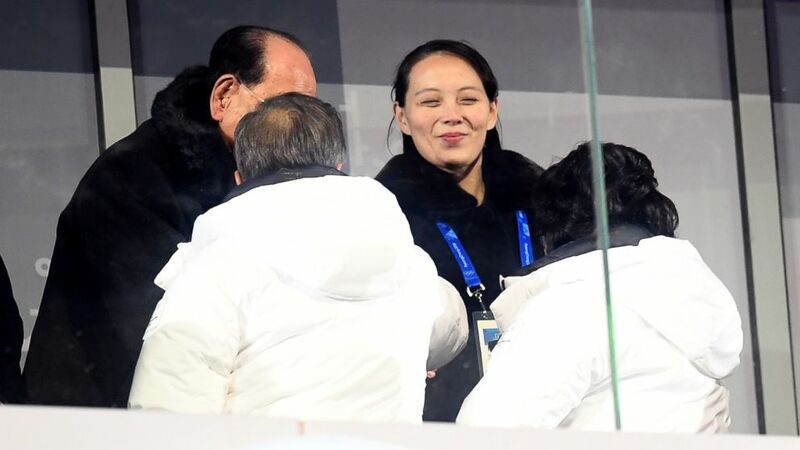 Kim Yo Jong, who is also known to be the propaganda director for North Korea's ruling Worker’s Party, was caught on camera smiling throughout her trip today. Delegates from the two Koreas reportedly exchanged pleasantries on the weather. 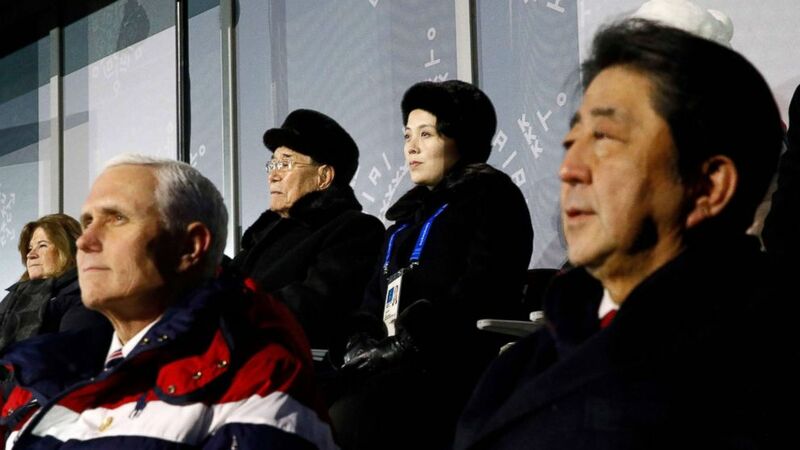 (Patrick Semansky/AFP/Getty Images) Vice President Mike Pence, Japan's Prime Minister Shinzo Abe (front R), North Korea's ceremonial head of state Kim Yong Nam (back 2nd L) and Kim Jong Un's sister Kim Yo Jong (back R) watch the opening ceremony of the Pyeongchang 2018 Winter Olympic Games Feb. 9, 2018. After being introduced at the Olympics opening ceremony tonight, South Korean President Moon Jae-in shook hands with world leaders in his box at at Pyeongchang Olympic Stadium. He turned around and publicly shook the hand of Kim Yo Jong in a historic moment for the Koreas. Meanwhile, U.S. Vice President Mike Pence sat just feet away from Kim Yo Jong in the box, but did not interact with the North Korean leader's sister. Pence also missed an opportunity to greet another North Korean leader, Kim Yong Nam, president of the Presidium of the Supreme People’s assembly. Both Kim Yong Nam and the U.S. vice president were at a reception hosted by Moon Jae-in,where Pence greeted heads of state and other world leaders. Pence’s office confirmed that while the vice president and Kim Yong Nam may have been at the reception room at the same time, they did not come across each other. Kim Yo Jong is scheduled to have a luncheon with the South's president on Saturday. Details regarding the luncheon have not yet been publicly revealed. Speculation has emerged within Seoul that additional meetings between the two high-profile figures could be possible during the remainder of the Olympic Games, according to South Korea's Munhwa Broadcasting Corporation.